As is clear from my prior posts, Matt and I take full advantage of our life in the mountains and hike most weekends. But the truth is that I like walking far more than I like climbing up and down mountains. That said, when Matt, our friend Carl and Carl’s brother Mark decided they were tackling the 4-day Inca Trail hike to Machu Picchu, I decided that I would regret not hiking more than I may end up regretting hiking the trail. We shall see if that proves to be true come early October. The last time I did an overnight hiking/camping trip was in 1984. Yes, 30 YEARS ago. Watertown (WI) Senior High School had this bizarre right of passage reserved for a select group of decent students: Survival Hike. Led by biology teachers Carlos Alvarez and Dan Herbst (I think another teacher, Tim Gifford was also along for the ride my year), Survival Hike occurred the summer after sophomore year and involved 5 days of trekking up to 20 miles per day in Northern Wisconsin with the “treat” of white water canoeing on the 6th day. The catch, apart from the fact that we carried our own gear, bushwhacked trails, were eaten alive by mosquitos and camped every night: no food. Actually, in the early years food was allowed. First, groups were given $20 to buy provisions for the week. By the time my sister, Mick, went on the hike, provisions totaling a few hundred calories were provided and included a dog biscuit and chocolate. Six years later, we were given nothing – we only ate what we foraged or caught. A few years later, the hike was discontinued. To this day, I have no idea why our parents allowed Mick or me to participate in Survival Hike. We were not an outdoorsy family and never camped. My mom considered it part of her martyrdom that our vacations were at a cottage with an outhouse. I was not athletic and didn’t own any gear; my mom borrowed a pair of hiking boots that were a size too big for me from a friend’s daughter and I have no idea where my pack came from. Apart from some city walking (we had actually moved to Wauwatosa during my sophomore year but I was given a special exemption to go on the hike, probably because my dad played baseball with Mr. Herbst), I didn’t train at all and never carried a pack. But I survived. Oh, I whined and probably cried, and threw up when the only thing we found to eat for the entire trip were unripe apples and raspberries (to this day I despise raspberries) on the first day, got about 50 mosquito bites and several blisters, hiked in the rain (I hate wet grass), and lost 15 pounds in 6 days, but I did it. I still don’t exactly understand why I did it, but I have some great memories from the trek: like when two of the guys had to share my friend Katie and my tent because they lost their tent poles and then one of the guys slept walked during a thunderstorm and knocked our tent down. You can imagine the ensuing teenage-girl hysteria. Or when some other kids were getting sent home due to health issues and Mr. Alvarez gave me the option to leave (I really was whining that much) and I made the decision to stay. I like to think that I stopped whining quite so much after that point, but that may be wishful thinking. Or the fact that a guy from Mick’s year, who cried and blamed her when their canoe tipped in the rapids, came along on my year (I think he was doing a bit for NPR) and acted all cool, college-guy when I knew the truth – he just wanted redemption. Plus, it was in the days where your parents signed some waiver and then you got to do totally dangerous, unhealthy things AT YOUR OWN RISK and they didn’t check up on you during the week. And it was long before cell phones so you were in the moment doing what you were doing (hiking! starving!) and not taking pictures and posting every two minutes or calling your parents (or your sister to tell her that cry-baby guy was on your trip although that would have been fun). In fact, I don’t have a single picture from the trip although I am sure someone took a few that I would love/cringe to see. So with that questionable history, I am signed up for the 4-day Inca Trail hike to Machu Picchu. Compared to Survival Hike, it should be a piece of cake: no bushwhacking, porters to carry the heavy gear, good meals made by the camp cook, decent hiking boots, 26.5 miles over the course of 4 days and no white-water canoeing. But the reality is that the altitude is a killer for many people, the hike is very steep both in ascents and descents, and I am 30 years older. This time, though, I am training and Matt and I have stepped up our weekend hikes to add more altitude. I am even carrying my daypack despite the fact that Matt is usually my porter on our hikes. So maybe my whining will be kept to a minimum on this hike although be warned Matt, Carl and Mark – I am not promising anything. Matt’s former secretary, Elvira, is a lovely woman and a talented one too. Last year she was learning traditional weaving at a school in Cajamarca. The school’s main purpose is to provide training to young people in an effort to provide opportunities for these students who otherwise would likely continue to live in poverty. The girls in the skirts come from traditional farming families. The school’s additional purpose is to promote traditional weaving techniques. Elvira invited us to come on a day when the students were learning to dye wool using both natural ingredients and dyes. The instructor was delighted that we wanted to observe and mentioned that she thought our presence and interest would also reinforce to the students that these skills are valuable and interesting. This batch was made using twigs from a type of pine tree. Notice the final product with all of the debris – I would not want the task of picking all the particles off the wool! The green and hot pink colors came from synthetic dyes. The pink and purple batches used a type of crushed beetles. Elvira’s current artistic endeavor is jewelry making. 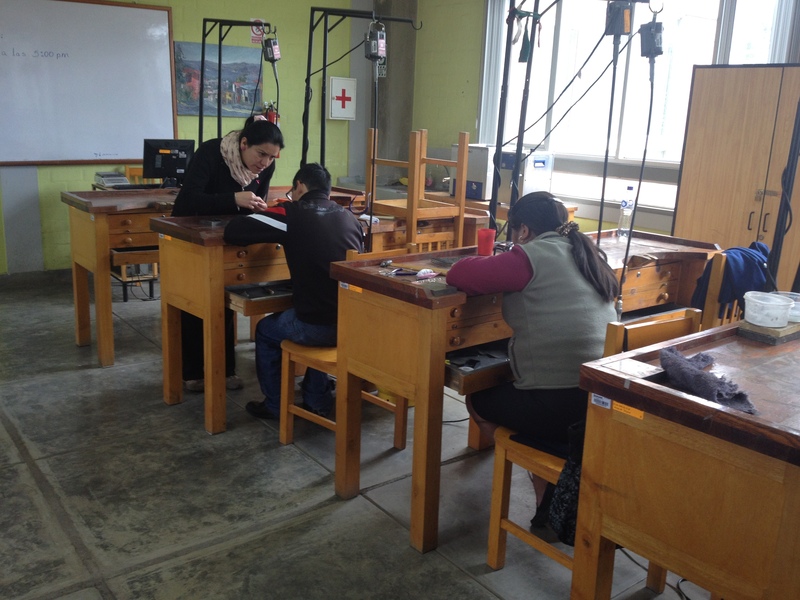 She takes classes at Koriwasi the Center of Technological Innovation in Jewelry that is funded by the Yanacocha mine in conjunction with the Peruvian Ministry of Commerce and Tourism. Its purpose is to teach jewelry making so individuals can set up small businesses and also to produce high quality jewelry for sale both in Peru and in international markets. Elvira invited me for a tour and as my prior manufacturing clients know, I love shop tours and this one far exceeded my expectations. Sarah joined me and we were treated wonderfully with many of the instructors taking time to explain (often in English!) the various stages of the process to us. We first saw the manual work room where the jeweler would create the object. Next stop was the kiln, where the silver is melted and a copper amalgam added to strengthen the silver, which is otherwise too soft. Jewelry from Koriwasi is certified 950 silver, meaning it is 95% silver. Sterling silver is 92.5% silver. Just as we were beginning to think this was a low tech process, we got to the design room. They have several computers and use three specialized softwares (Type 3, 3Design and Rhinoceros). But the coolest part was seeing the 3D printer that prints a mold in wax. A small item takes almost an entire day to lay down the layers of wax to create the mold. 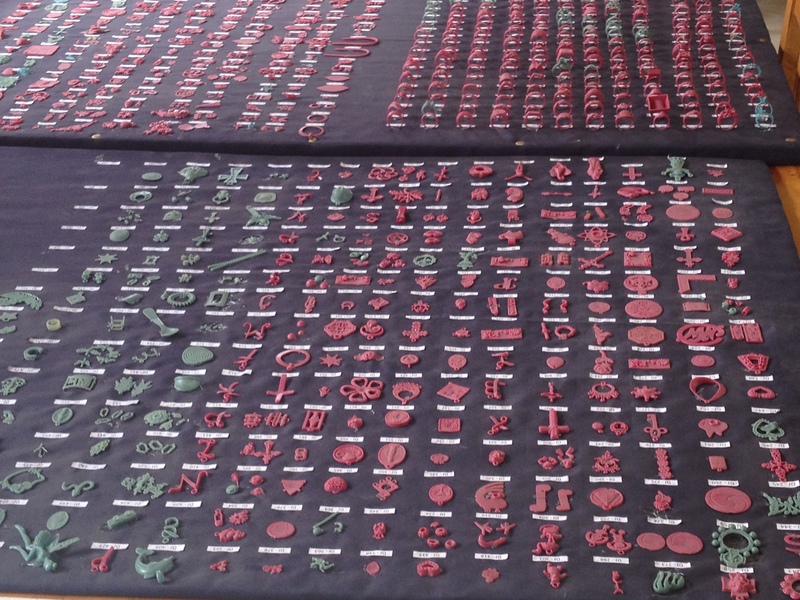 They also have 2 other computers that create a mold the opposite way – wax is cut away to create the item. We learned that there are literally millions of dollars invested in the equipment of the school. Very impressive. We then went to the casting room. I have always had a hard time understanding the casting process despite countless museum visits, including several to the amazing Rodin Museum. So for me it was fantastic to have the process explained to us and to be able to see many of the steps in the process. As I understand it, the process is as follows (any errors are my own and not due to the patient instructors and Elvira who explained everything very carefully to us and answered my many questions). 1. Start with a metal master model of the piece. 2. Press into rubber molding material to create a mold of the model. 3. Very carefully remove the model, leaving the mold intact. 4. inject wax into the mold to create the pattern. 5. Attach the wax patterns to a trunk to create a tree. 6. The tree then gets placed into a cylinder and is covered in a plaster mixture, leaving the base of the trunk uncovered. Once the mixture has hardened, the cylinder is heated. The wax melts and runs out of the mold, leaving a hollow mold in the plaster. 7. Molton metal (silver in our case) is poured into the trunk opening in the plaster, filling the void. Once cooled, the plaster is washed away. Violá – metal trees! 8. The jewelry is then cut away from the base and finished. One of the most interesting things is that even for items that are “mass” produced, it is still a labor intensive, hand detailed process. Very impressive. Our only disappointment was that the store was rather empty because many pieces had been taken to an out of town show! It’s 7:00 am and I am hitting redial on my phone as though the local radio station is giving away $1,000,000. I wish – instead I am trying to get a follow-up appointment with my doctor. Added to the list of things that are just different in Cajamarca, is healthcare. Not necessarily worse in all respects, just different. My situation started last week when I decided it was time to see a GI doctor for my on-going stomach issues. I got a name from a friend and toyed with having Matt’s school nurse make the appointment for me, but I decided to be a grownup and do it myself despite my anxiety over talking in Spanish on the phone. I called last Monday around 9 am and was told that the doctor’s appointments were full for the day. Fine, could I please make an appointment for another day that week? After asking for the response to be repeated several times, I thought I was being told that appointments could only be made for the day one is calling. When I asked when I should call, I was told “earlier.” As this seemed bizarre and inefficient to me, I assumed I was misunderstanding and asked Matt to have his nurse make the appointment for me. He came home and said she would be calling the next day. Apparently, my Spanish was dead on and you have to call on the day you want the appointment. The nurse did so and my appointment was for 8 pm on Tuesday. We had been to the doctor once before (the nurse made the appointments and those were in advance, go figure), so we knew that we needed to get to the clinic early to pay and check in. In this respect, the Peruvian system is better, at least with our school-provided insurance. You pay upfront for everything, so there are no surprise medical bills 3 months later. My co-pay for the specialist visit was $12.50, and this amount includes the follow up visits as well. I pointed out to the clerk that I was a woman – my form listed me as a man – and she told me it was the insurance company that incorrectly coded me and pointed to their office and told me to talk to them but not to worry about it for the appointment. The insurance clerk was busy, so we stepped aside and waited with everyone else. We soon noticed that a nurse was coming out of a door and calling a few patients at a time. They would step inside for a few minutes and then go down the hall and wait by various other doors or go to another floor. We deduced that she was likely taking the basic information: temperature, blood pressure etc. Miraculously my name was called after only a few minutes. But when I stepped up, the nurse looked startled, asked me if I was a woman and, when I confirmed that was the indeed case, told me to wait a little bit. A little bit stretched into 20 minutes and my anxiety rose. One of our friends waited for her doctor appointment for an hour the prior week only to be told that the doctor had gone home because she was his only appointment. I didn’t want to have that happen to me although the place was teeming with patients. By now we had figured out that I missed my first chance because the nurse was calling men back into the room. So the next time she came out and called for another woman, who arrived long after I did, I stepped up and said that I had been waiting. The nurse was very apologetic and I went in with the other lady. We were seated next to each other and all of our vitals were taken (is it bad that I was happy that I was taller and weighed less?). After living and breathing HIPAA, this was a very odd experience! The nurse then walked me to the doctor’s office, but it was empty and she placed my file in the middle of a stack of files and told me to wait in the hallway. At this point, we were standing in a narrow hallway with a bunch of other people. Thankfully, many of them had infants and we surmised that they were all waiting for the pediatrician, not my doctor. Once the doctor arrived, things moved pretty quickly. The first guy went in for a little while, came out, and called the name of the next in line – again, no HIPAA concerns here. It also became apparent that all appointments were made for 8:00 pm and you wait your turn (designated when you made your appointment) beginning at 8:00. We had to go back to the check-in line to pay for both the medication ($1.80) and lab work ($4.50) and then take the receipts and paperwork to the pharmacy and lab, respectively, to get what I needed. Again, no health care cost surprise down the road. Pros: Kind workers, upfront costs, no fake HIPAA privacy (come on, if you are all sitting in the waiting room, you are seeing each other, right?). Cons: Inefficiency in appointment making and waiting times (although overall the waiting was not really worse than in US and maybe it is better to wait in a hallway with your clothes on than in the inevitably freezing waiting room in a paper gown). Disgusting factor: Lack of sanitation. I noticed on the follow up visit that the bathrooms have no toilet seats, were filthy, have no hot water and no towel/dryer for one’s hands. UGH. It is no wonder that I have stomach issues here! The last party of Carnival is the Unsha, where a tree is cut down, moved somewhere else and “planted” in the ground, street, wherever, and then decorated with presents, danced around and chopped down at which time there is a mad dash for the presents. 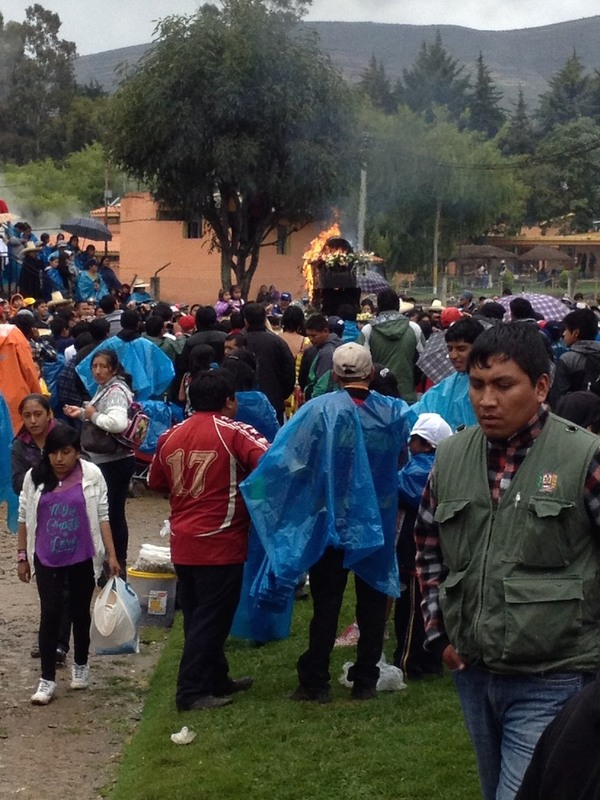 We asked several Peruvians the origin or symbolism of Unsha and were told it was just a Cajamarca Carnival tradition. So whatever the initial meaning was, it is apparently lost! 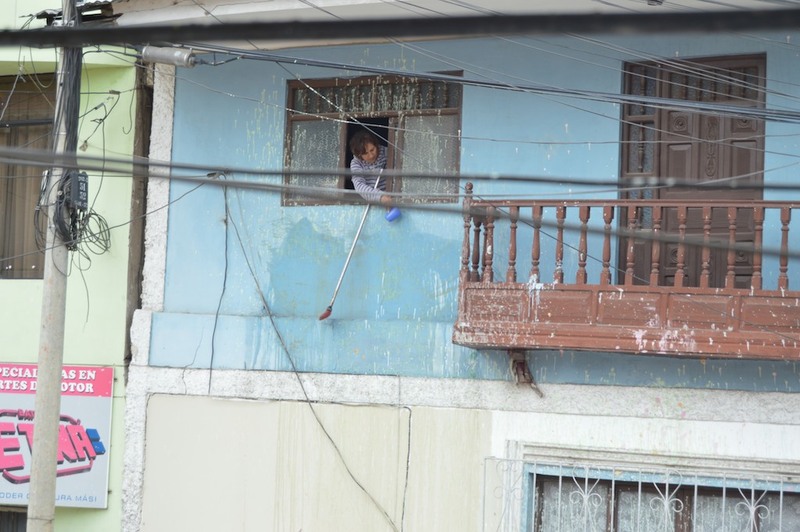 Different neighborhoods, or barrios, have their Unsha celebrations, as did Matt’s school. The Davy Unsha operates as both the traditional Carnival celebration as well as a staff party and newbie hazing. We were warned, so we knew to have an extra change of clothes although I managed to decline the hazing ceremony, so avoided the eggs on my head and was just sprayed with water and dusted with baby powder. I hate parades. I like the crowds, merriment and people watching before the parade, but I get bored silly sitting on the sidelines and watching endless streams of paraders. Until attending Markesan’s June Dairy Days parade became a cottage tradition that I was shamed into by my young niece and nephew, I had managed to avoid parades for a good decade. 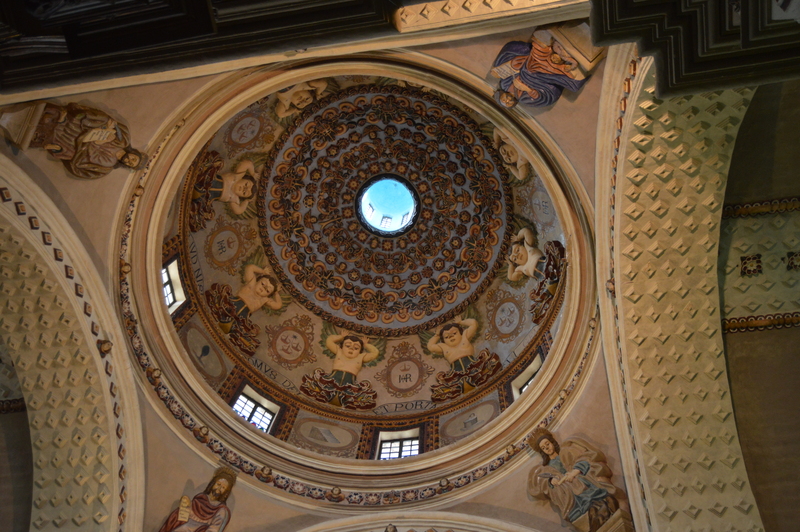 Then we moved to Cajamarca. There are parades for Saints, Patria (Independence), Carnival and endless other reasons, or so it seems. Because we want to participate in cultural events, we have gone to most of them. For Carnival alone we attended 3 parades, the paint parade and two “normal” parades. We were under the impression that Sunday and Monday’s parades were distinct, but with the exception of some floats, generally carrying the barrio (neighborhood) queens and princesses, Monday’s parade wasn’t much different than Sunday’s parade. On Sunday, Matt, Mistina and I went to the parade early and managed to get a good standing spot near the beginning of the route. The vendors were hawking everything from food, toys, super soakers and plastic, hats and umbrellas to protect from the super soakers, balloons and pails of water that are customary at all of the Carnival events (including the burial of the Ño Carnivalón!). After waiting about 1 1/2 hours, the parade began and even I was impressed. The costumes were fantastic and so different from what we have in the US (or at least at June Dairy Days). The only major irritation was that despite staking our spot for 2 hours, we were battered by people shoving past us. We lasted at the parade for about 1 1/2 hours before I got bored. We then went to two teachers’ house for additional festivities that included throwing water balloons off the balcony at departing parade attendees. Note: there was major retaliation when a guy threw a bucket of water at us and then a flatbed truck spotted us and drove down our street to douse us with water. We also had the special treat of a homemade Cajamarquino meal: Chupe verde (my favorite herb soup with potatoes, egg and fresh cheese), chicharrones (fried pork), sweet potatoes, yuca, corn and delicious Peruvian condiments. Dessert was fresh cheese with honey. Delicious! As if the food wasn’t amazing enough, we also had very pure cañazo, 14 year old beer and chicha de mani (a peanut based liquor) that had a smell reminiscent of Chinese food and an interesting smoky flavor. After eating, the karaoke machine was set up and we listened to our friends sing Peruvian songs. Then the dancing began and we got some salsa lessons. Honestly, I think Latin Americans are born knowing how to salsa; I clearly was not as I am usually thrusting the wrong hip! On Monday we were off to another parade, but this time we were prepared. Mistina, Sarah, her 2 1/2 year old twins (Emma and Beau), Matt and I went to the parade route and after a block of scoping out the crowds decided that paying 20 soles each ($7.20) for front row seats was worth it! Later we realized that a front row seat with a plastic roof might have been a better idea. We were generally exempt from intentional water attacks due to Emma and Beau so we didn’t get to use our balloons as that would have prompted an attack that would have certainly involved the kids. And then the parade began and apart from the floats and the fact that some of the marchers looked like they had been drinking all night (and probably were), it was just like the parade the day before! We lasted about 2 hours (after waiting 2 hours) and then decided to leave. Little did we know that leaving was not easy as access to the route is blocked off by viewing stands, makeshift structures, trucks and the like. We walked several blocks before there was a small opening that we were able to climb through, with the help of many kind strangers, to get out. The parade lasted several more hours, so we were all happy we left when we did. Next year, two parades will definitely be my maximum and one might even suffice. Note the kid in back! Everyone wanted a picture with this guy! Today we have another Carnival Celebration: the Davy College Unsha. A tree is erected and then you have a party to chop it down! Last night we watched a tree get dragged down our street and then a few hours later Mistina and I walked down the block to see what the commotion was. With the world’s dullest ax they were cutting branches off the bottom so that the tree would fit it into the hole in the middle of the street. I was not convinced the power lines were safe so we left as they erected it. Apparently these trees are “planted” in the streets all over the city! Cajamarquinos know how to party! 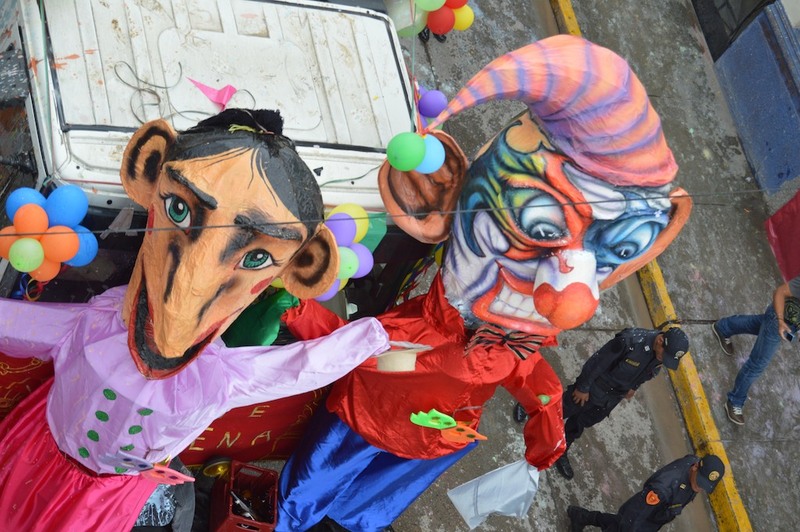 Cajamarca is the Carnival Capital of Peru and the official Cajamarca “Programa Carnaval” has events beginning on January 23 and ending on March 9. To the uninitiated (us) it was a little hard to figure out what is Carnival related and why, but here are the main events that we experienced. Water, Water everywhere. This phenomenon actually began before January 23 when my friend Mistina and I were on a walk and got sprayed with water from a passing vehicle. She bore the brunt of the attack and looked at her soggy clothes with a shocked expression . “What was that? Is this water?” We decided to assume the best, that it was water, but were confused by the experience. We had never encountered any anti-American animus but wondered whether something had happened while we were on Christmas break that would lead to random, anonymous aggression. A couple days later I was walking my usual bike path route when WHOOSH! A bucket of water was thrown at me. Thankfully, the aim was off so I was merely splashed with the aftereffects. I turned and yelled at the passing vehicle (maybe even made a nasty gesture, it was instinct, I swear) and the guys in the truck bed were busting a gut. Matt did some investigation at work and learned that water antics are a part of Carnival and start sometime in January. So attacks with water balloons, super soakers, buckets and hoses are all in good fun, condoned and to be expected. Despite this, we didn’t have too many other experiences with random acts of water until the parades this past weekend. Matt inadvertently stumbled into a water fight in our neighborhood last week, but as some of the participants were his students they respectfully gave him a pass. The same thing happened this weekend as we were walking from one of the parades. Ño Carnavalón. This guy shows up everywhere and can best be described as the Life of the Party (or, in this case, Carnival). For awhile I understood him to be a demon but I am not sure that is the case although he was dressed like a devil when he got married to the Doña Carnavalón in Baños a couple of weekends ago and he generally looks pretty scary. Saturday’s parade was the Ingreso de Ño Carnavalón (Arrival of the Carnival Ño), the event that really gets the party started. Sunday and Monday’s parades featured the Ño (or various versions of him), last night was his wake (yep, he died. Probably from too much partying) and today was his cremation in Baños. RIP until next year Ño Carnivalón, and maybe we can finally get a full night’s sleep! Last night the music started in Baños at 11:30 pm and this morning on Matt’s 5:30 am walk to work he passed three guys, one holding up his friend, who was holding a beer, and the third playing a snare drum. The party never stops! The Paint Parade. “Stay home,” we were warned, “It’s dirty. People are out of control.” Saturday’s parade, while technically called the Ingreso de Ño Carnavalón, is locally known as the paint parade. 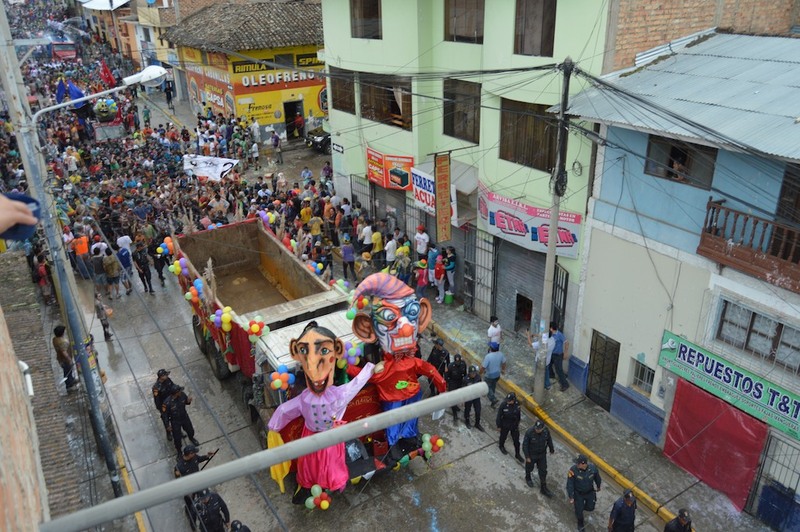 Apart from the truck carrying Ño and Doña, the rest of the parade is comprised of gangs of people, who sing, dance, drink and throw paint at everyone and everything. People, cars, houses, the police – nothing is sacred. We were invited to our friend Maribel’s house, which is conveniently located on the parade route, for breakfast and to enjoy the parade. And by “enjoy” I mean lob water balloons and, when those ran out, buckets of water at the parade participants from the roof of her building! Not that we were safe. First, I will never engage in bomb making as I managed to soak myself (and Matt) by overfilling balloons. Kiera, Maribel’s niece, was worse and changed her clothes 2 times before we even began (of course, she is only 8). Then the neighbors decided to wage water war on us (and they were slightly higher up and had better throwing arms) and finally, this truck was in the parade to retaliate against roof watchers like us. Remember the crying Indian Chief in the Public Service Advertisement in the 70s for the Keep America Beautiful campaign? He paddled his canoe through a garbage-strewn river, passed industries spewing pollution, landed on a highway watching cars choke out fumes and, ultimately, had garbage thrown thrown at his feet. That guy is bawling here in Cajamarca. For a culture that worships Pachamama, or Mother Earth, the lack of respect for the land is puzzling. It is shocking to see trash everywhere and people littering without an apparent care. When we went to the Baños bash, we had to walk a few blocks to find any trash containers; everyone else was simply throwing the used food containers on the ground. Shortly after arriving here, I saw a tiny child throw a plastic cup and spoon on the ground after finishing a jello treat. The first time I was stunned and assumed the mother didn’t notice. Now I realize that the mother taught the child to throw her trash on the ground. The odd part is that our garbage is picked up 7 days a week. There are also street cleaners – people, not machines – that go out every day to tidy the streets. But there is simply no way to keep up with the constant stream of trash. It isn’t just the litter, either. The concept of using less plastic or disposable items doesn’t exist here. Even if I bring my tote bag to the grocery store, the clerks still want to put my groceries in plastic bags first. All of the street food is served in plastic or styrofoam and there are countless street vendors. 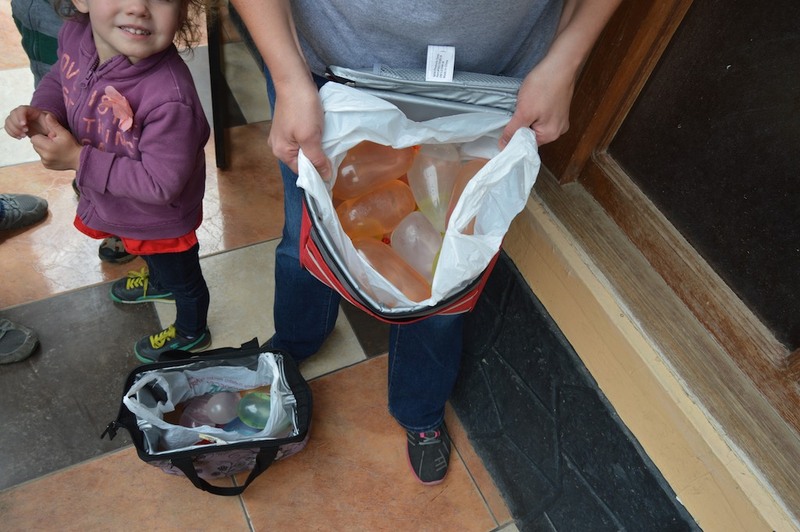 When we arrived, Baños had no recycling program. It was painful to throw out plastic bottles and other recyclables, but we were told that while we could bring them to school theoretically to be recycled, there isn’t really any such program in the area. Baños now gives us a recycling bag every week or so and we use it, but it is likely the recyclables also end up in a landfill. Actually, the plastic bottles are collected from our trash by farm ladies, so at least there is some grass roots recycling. Unfortunately, these ladies often tear apart the trash bags and leave the rest of the trash scattered on the sidewalk and street after they take what they want. So even before the recycling bags, we would try to leave the plastic in separate bags to reduce the mess. Water fares no better than land. We have rivers that run from the mountains into Baños, but instead of being fresh, glistening springs, they are also choked with pollution. Bags of trash are dumped in the rivers. People wash themselves, clothes and cars in the rivers, the latter by actually driving their cars into the water. While I recognize that some of these people are very poor and may need to wash themselves or their clothes in the river, the same cannot apply to their vehicles. It is simply acceptable here, as evidenced by excavation companies pulling their dump trucks in the river to rinse off the excavated rocks. I am adjusting to aspects of my life in Peru, but I don’t think the prevalent trash ever will be one of them. Cajamarca is the dairy region of Peru, so we Wisconsinites feel right at home. There are a lot of cheese shops although to our amusement the large grocery store also sells Crystal Farms cheeses (not Wisconsin’s finest, unfortunately). 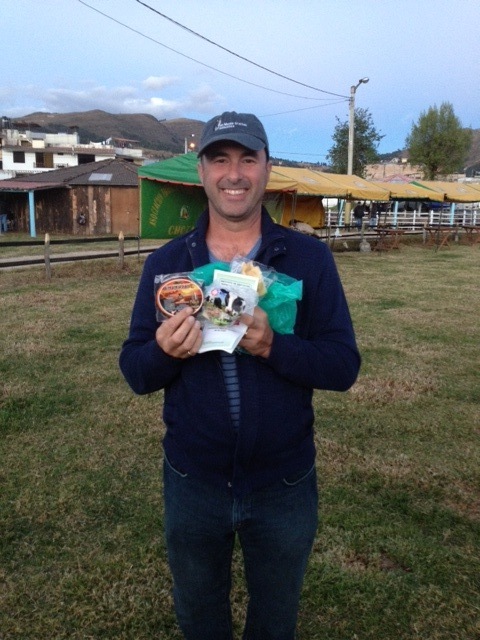 No novices to state and county fairs, we were excited to experience the Cajamarca Fongal, or state fair, in late July. Cruz had cautioned us that the Fongal had diminished over the past few years and that people got really drunk, but as that didn’t sound much different than Milwaukee’s Summer Fest or the Wisconsin State Fair, we weren’t dissuaded. 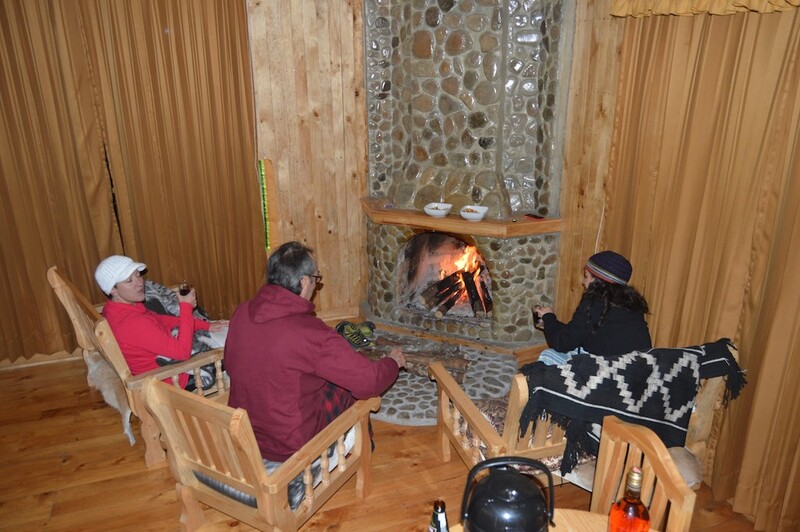 On Thursday we arrived around 5:30 and it appeared that the Fongal was not yet in full swing. We watched some sheep and alpaca get unloaded, visited the few food and craft booths that were open and generally tried to avoid the cow and other animal pies in the field. Hey, the Alpaca is Escaping! There were two types of food booths: the ones that sold packaged products and the ones that sold various hot foods. The Fongal was not as clean as the Mixtura and this adventure was shortly after we arrived in Cajamarca, so I wasn’t keen on eating any of the hot foods. We did get tastes of various products and bought the soy puffs, some fresh cheese with herbs and chocolate. As usual, the vendors were really nice to us and patiently explained their products. It gets totally dark by 6:30 (every day, that’s life near the equator) and there wasn’t much happening, so we left about that time. On Saturday we again walked over to the Fongal around 5-ish, thinking we would check out the scene while it was still light and return later for the Kurt Cobain concert. Yep, Kurt Cobain “Peru” was playing. We were cracking up over that and Matt even said to the ticket seller “Kurt Cobain is dead,” which earned him a laugh. While the fair was busier than on Thursday and more booths had opened, we unfortunately arrived just as some traditional dancing and cow showing (not related) ended and then the events were over apart from the concert. My sweet tooth overcame hygiene and we indulged in piccarones, fried sweet potato/squash doughnuts topped with sugar cane syrup, that are quite similar to my Auntie Rose’s famous St. Joseph’s Day tucinelle. We caught a few songs of an opener band and then headed home with the intention of returning later for Kurt Cobain. Instead we ended up in Cajamarca for drinks with Cruz and the new American teachers. We went to a place called Full Skee (which we understood to basically mean “you are full of sh*t”) where they had a huge drink menu, including many American favorites. I had a very tasty American cosmopolitan before switching over to a Peruvian pisco sour. The place had excellent drinks, a good vibe and nice music but was oddly well lit. 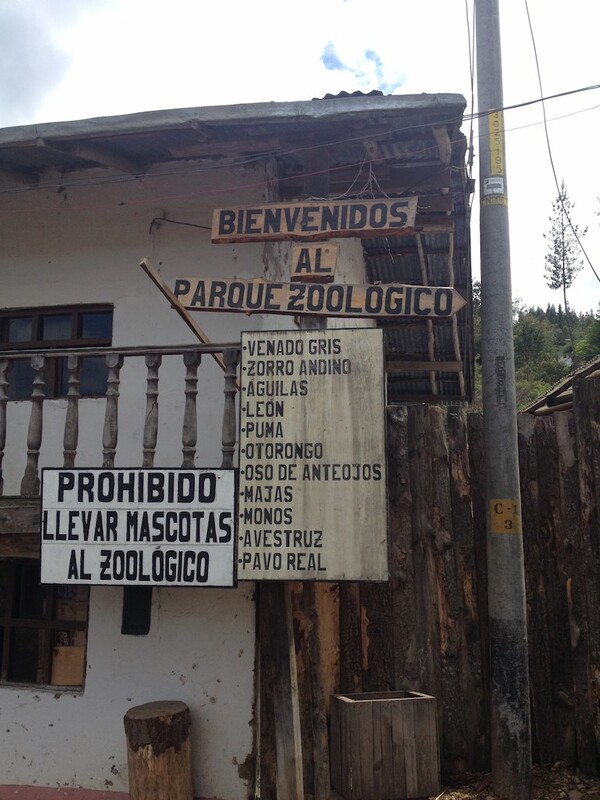 No beer goggles in Peru, apparently. 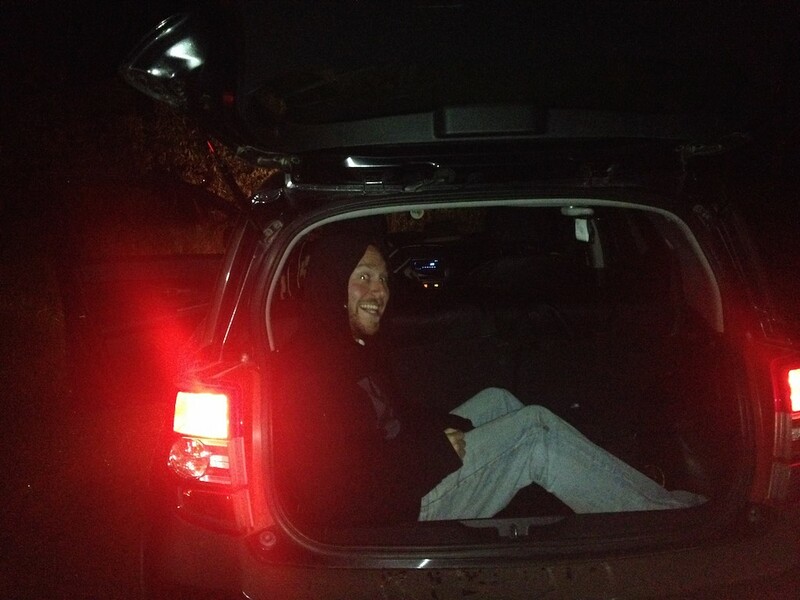 We got home around 1:15 and while Kurt Cobain was still in full swing, Matt and I did not stop in at the Fongal. Expecting a Nirvana cover band, I was surprised the band was rocking “Sweet Child of Mine” and “I Love Rock and Roll” instead. I suspect poor Kurt was rolling in his grave.